Already, in the latter half of the previous century, intriguing hints about Tibetan secret teachings had been carried to the west by Helena Blavatsky, who claimed initiation at the hands of the Holy Lamas themselves. 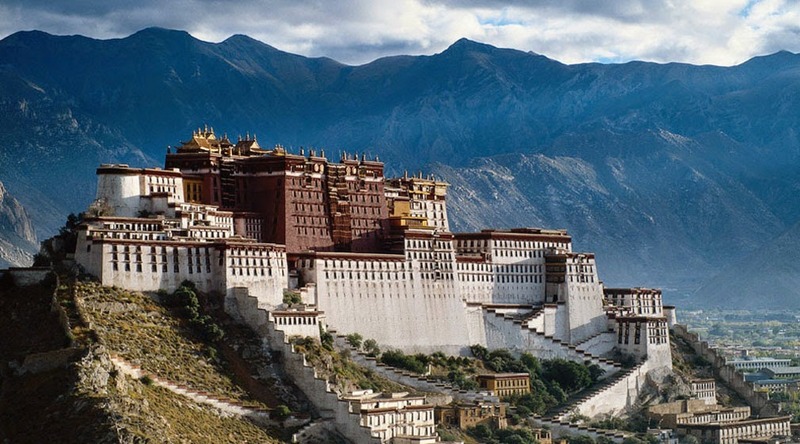 Blavatsky taught that her "Hidden Masters" and "Secret Chiefs" had their earthly residence in the Himalayan region.The Nazi leaders were attracted to Tibet by these rumors of its secret doctrines. The Thule group, the Luminous Lodge, and the various other occult organizations which helped shape the Third Reich, believed in an esoteric history of mankind. 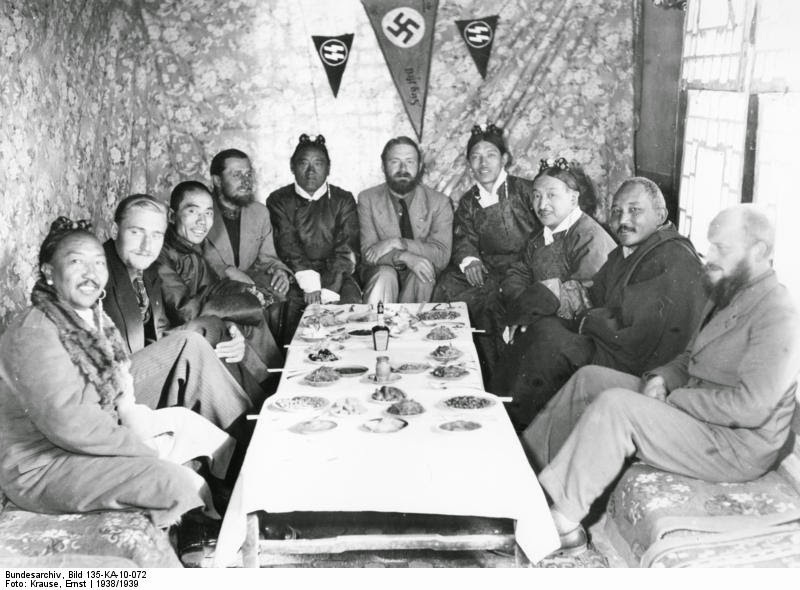 And they believed that it was in the archives of Tibetan monasteries that this history was preserved in its purest form As soon as the Nazi movement had sufficient funds, it began to organize a number of expeditions to Tibet and these succeeded one another practically without interruption until 1943. In 1938-1939 a German scientific expedition was led by German zoologist and SS officer Ernst Schäfer. 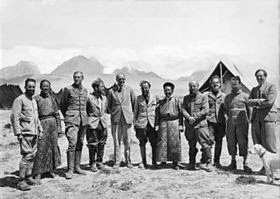 Schäfer stated that the primary objective for the expedition was the creation of a complete scientific record of Tibet, through a synthesis of geology, botany, zoology, and ethnology, referred to in the German science of the day as "holism". ( to believe that the human being, composed of a mind, body and soul integrated into an inseparable whole that is greater than the sum of the parts, is in constant interaction with the universe and all that it contains. Health and well-being depend on attaining harmony in these relationships). Conclusions that the Schäfer Expedition was "purely scientific" now appear in historical context as being conducted with a more sinister motive. British writer Peter Hale observes that "while the idea of ‘Nazi botany’ or ‘Nazi ornithology’ is probably absurd, other sciences are not so innocent – and Schäfer’s small expedition represented a cross-section of German science in the 1930's." To Hale, this has considerable significance as "under the Third Reich anthropology and medicine were cold-bloodily exploited to support and enact a murderous creed. Conclusions that the Schäfer Expedition was "purely scientific" now appear in historical context as being conducted with a more sinister motive. Under the Third Reich anthropology and medicine were cold-bloodily exploited to support and enact a murderous creed. It appears now that "occult science" was also a strong motive for the expeditions. 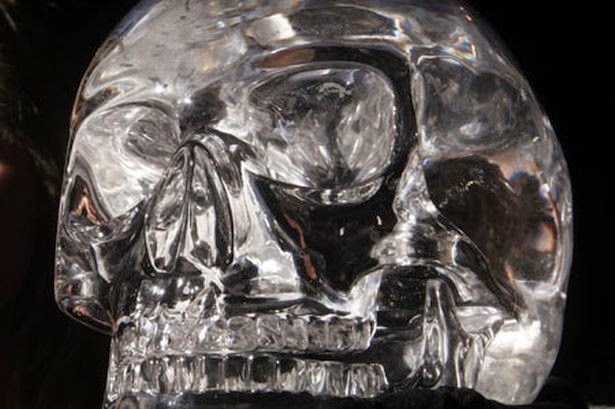 On the March 6, 2011 the discovery of a mysterious crystal skull made headline across Germany. The headline read: "Crystal Skull (of) SS Fuhrer Heinrich Himmler discovered"! The artifact, found in the home of an old lady once married to a high-ranking SS officer was resting in a old wooden box beneath the roof of a house in a Bavarian village. It is believed it may be part of a larger trove of bounty once owned by the most sinister man in Nazi Germany-Heinrich Himmler. 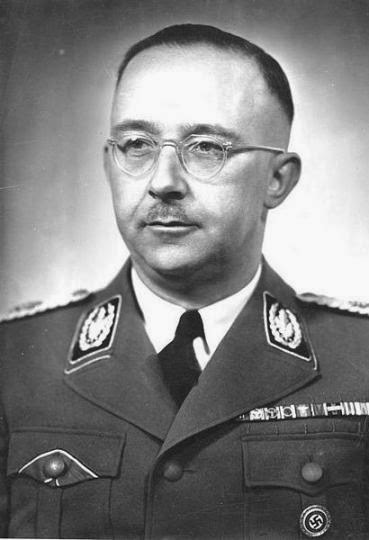 The second most powerful man after Hitler, Himmler oversaw the extermination of Jews, was spellbound by myths and legends until his suicide (using a poison capsule hidden in his mouth) after being captured by the British. He financed expeditions all over the world by Indiana Jones-type SS men seeking proof of the “supremacy” of Aryan man. The skull, which weighs nearly 20 lbs is 1,000 years old and could be one of the legendary Mayan skulls that belonged to the lost, ancient race of Mexico. It is of the same design as the death’s head on the uniforms of Himmler’s henchmen, the notorious SS. According to legend, the Mayan skull, which was stolen from Tibet by the Nazis was imbued for believers with magical powers to enable mankind to survive an apocalypse. (It is currently in the hands of a journalist who continues to conduct tests of its authenticity). It is known that Tibetan Buddhist Monks have used one particular crystal skull for healing and divination and they call it Amar. 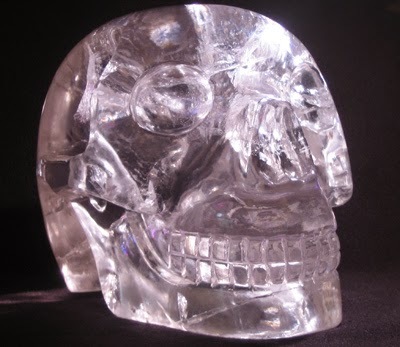 Said to have ancient origins, Amar is one the largest known old crystal skulls, at 22 lbs, and is made of Clear Quartz. Tibetan Quartz is believed to facilitate access to the Akashic Record. Amar embodies the energies of love and compassion, just as the Dalai Lama does. With it healers and oracles were centered in the monasteries, and were responsible for identifying the afflictions of their surrounding community. In 1959, The Dali Lama Fled from the invading Chinese to and took with him the Amar skull over the long 14 day journey to Nepal. Amar is presently cared for in a peaceful spiritual sanctuary in North America. 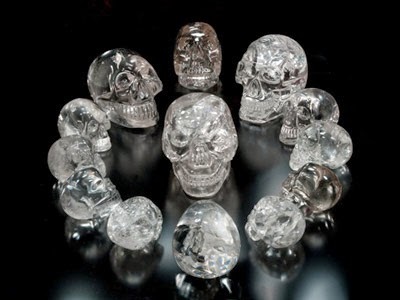 Twelve such crystal skulls are known, and with the discovery of Himmler's crystal skull this would be the secret 13th now. According to legend, all 13 are needed to create a new age of light together to prevent the Apocalypse. Perhaps what the Nazis sought to use for their own dark and evil purposes will instead be seen as the beginning of the dawn of a more peaceful and enlightened mankind. Good articel. Just please stop assuming. They can´t be used for anything else than what they were programmed for.